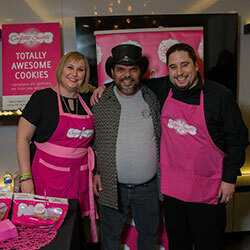 A few years ago, Kathy Leskow (Management ’96) sold her cookies exclusively at farmers markets. 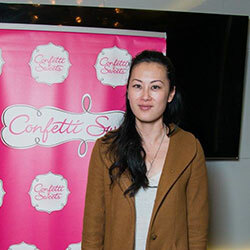 These days, the owner of Confetti Sweets hands them out to Hollywood stars. This February, like she did in 2015, Leskow took her treats to Tinseltown, partly for fun, mostly for marketing. 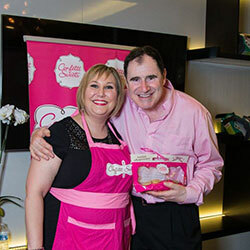 She and her husband tied on Confetti’s signature pink aprons and shared roughly 80 dozen cookies during a 2-day stint in a “gifting suite” in the swanky London Hotel as part of pre-Oscar festivities. She got the gig by reaching out to event organizer GBK Productions. That makes the trip part of a growth strategy that has helped create a company with 17 part-time employees and two retail locations. It has the added benefit of helping her catch up on who’s who in the movies. “I don’t know who they are – until after, when I Google them,” Leskow admits of the stars she meets. Here’s a look back at her time among those who are famous to most of the rest of us. Jamie Foxx, Oscar winner for best actor for Ray – “He had his daughter with him and she was anxious to get going because she was hungry,” says Leskow. I said, ‘Well have some cookies.’ She said, ‘I’d rather have steak.’” The seven-year-old (Leskow guesses) didn’t have a cookie in the end but she did take one for the road. Here’s proof that it’s still a small world: 2 NAIT grads meet in Hollywood over cookies. Not being a movie buff certainly helped Leskow see the actors, writers and producers in the same light as she would anyone else. But she was struck nonetheless by how easily she could relate to them. Hopefully, growth. Leskow would like to open another Confetti Sweets location in the next couple of years. 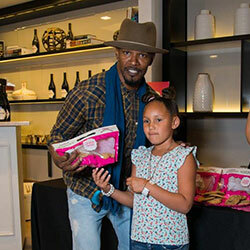 As for next year, she and her husband are exploring the possibility of handing out cookies in gifting suites at major sporting events, such as the Superbowl.